The afternoon sun was starting to set as I stepped outside my tent overlooking the cove below. The Wilderness Campground on North Haven Island in Maine was so peaceful now. 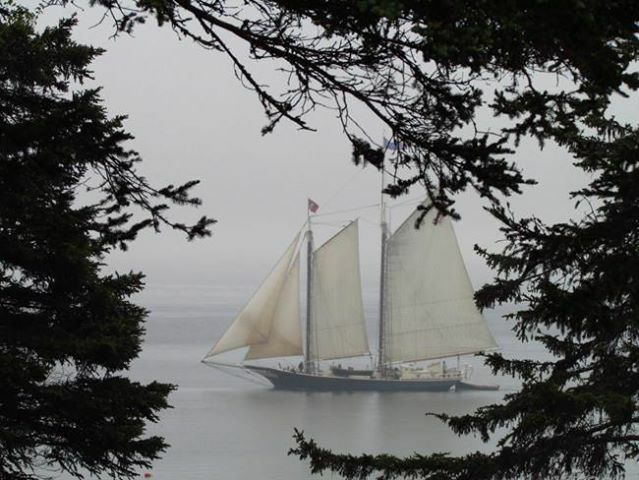 Unknown to me the windjammer Mistress was entering the cove below. 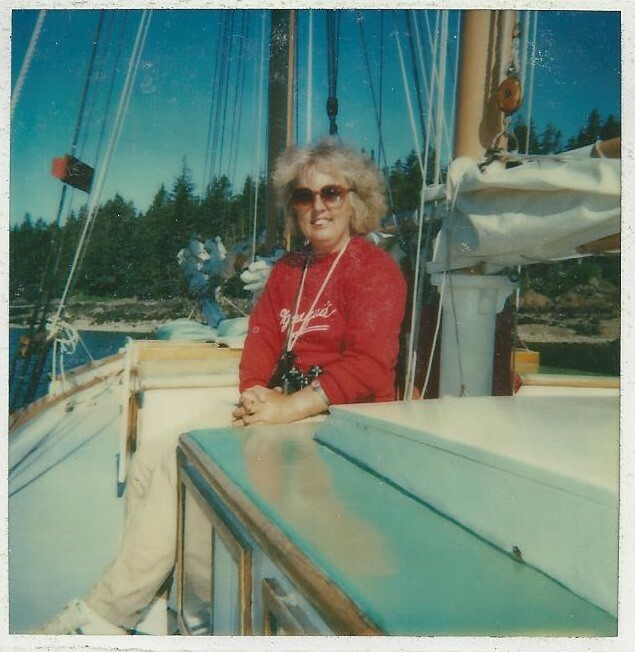 When I discovered her, I started to watch as they took soundings with their crew. She had just tuned around and was putting her anchor down. I moved my folding chair from near my tent to an opening in the trees. This way I could relax and drink my coffee just freshly made on the campfire, and watch them as they got ready for evening. Just before it got dark they let down their little dingy. It made me curious. About ten minutes later I heard what I thought was low voices, smile, it was. Just a short distance from my tent was a path leading up from the shore below. The voices got louder, and the little noises they made climbing up the path from the shore. Then out from the trees came two ladies, who got startled when they spotted me. They kept walking and heading toward the outhouse just up over the hill. I made sure I had fresh coffee on the campfire to offer them. The aroma must of reached them for they stopped and chatted with me. Their names were Ethel and Pammy. The two families, husband and wife's had gone on this cruise together. For them this was a reunion for the families, for they had not had contact for about 10 years. Oh how we laughed and talked so freely. It was like we had known each other forever. After a bit they headed back to the Mistress so the Captain would not be worried. I of course wished them a happy cruise and reunion. About 6:30 AM I heard a noise on the water, and saw the dingy coming ashore. Ethel and Pammy came to my camp ground and said the captain had invited me aboard the Mistress for breakfast. I said are you sure, and both in unison said yes. So I got a light jacket and went down the path with them to the dingy. The mate did the rowing out a short ways to the boat. What a beautiful way to start my day off. The captain and his mate introduced themselves to me. They were brother and sister, Jack and Sharon. Captain said Ethel and Pammy had told him I was camping alone on the hill above by myself. Jack said to them we will get Bobbie first thing in the morning and have her come to breakfast. Captain Jack and his sister Sharon started cooking in the galley. The aromas just wafted on out up to the deck from the galley. While they were cooking I chatted with Pammy and Ethel, and their husbands Al and Joe. They all lived in the Boston area when they were kids. Even graduated from high school together. After that time they both had gotten married and moved away. Well just after 7:oo AM captain called us all. We sat at a small galley table. Captain and his mate served us cheese omelet, bacon, and homefries, toast, and small glass of orange juice. It was all so delicious. We talked about where we had all come from. It was so pleasant. We all chipped in, the ladies and I, and did the dishes, while the men went up on deck. With four of us cleaning the table and drying dishes, we were done in no time. Then we all went up on deck and sat around for a little bit. The captain asked if I would like a tour of the Mistress. Of course I said yes. Ethel and Pammy showed me around. Their sleeping quarters were 4 hammocks secured in place, fairly close together. The Mistress could only hold 4 guests, and the captain and mate. I was awe struck by the wood finishes, and how compact it all was. Ethel and Pammy had dreamed on doing this cruise when they were in high school together. Well, noon time came quickly, and the mate rowed me ashore after we had all said our good byes. We hugged and kissed and knew we had made friends for a long time. I had chores to do around my camp sight and got busy doing them. Just before dark the Mistress pulled up anchor and left. What a beautiful time I had had with them all. One I will never forget. Next day about 4:00 PM the Mistress came back into the cove, and I watched. After they had turned around and anchored I stopped watching and relaxed. About half hour later as I watched the ocean, another ship came into view, it was the Victory Chimes. Wow, I thought for it was huge, it had six masts. So I was kept busy for a few hours watching them anchor. Because of it's size they had to be further out then the Mistress. It was starting to get dark so I got everything in close to the tent. And made a small campfire to sit at for awhile. To me the odor of pine trees and a campfire burning were heavenly and relaxing. About 8:00 PM I let the fire die down, and made sure it was out. As I retired to my tent I took a last look at the 2 windjammers. That night I slept well and woke about 6:30 AM in the morning. Was busy around my campsite for a few hours. About 10:00 AM I saw a few dingy's come ashore just below my campsite. It was interesting to watch them. I could tell they were bringing supplies ashore. This went on for an hour or so. Just after 12:00PM Ethel and Pammy came to my campsite and asked if I would like to go to their clambake on the shore below. I thought for a few seconds , and then said why not. Both of them said when they were ready to serve they would come and get me. Of course I said okay. It was maybe a little after 1:00 PM when they said come on down and join us. Off I went for a few hours. What an education that was to see how they cooked, corn, lobsters,clams, and other vegetables in the huge campfire with seaweed. Let me tell you, with all the guests from Victory Chimes and the Mistress all together they had a rousing party. A little wild for me. Tho they were all kind to me and waited on me. After I ate a lobster, some corn and clams, I started to fill up, smile. Next came the desert. They had made strawberry shortcake along with peach upside down shortcake. I had a little of both along with a bottle of ginger ale. Everything tasted so good. I thanked them for a good meal and left going back up the steep path to my camp site. As it started to get dark I settled into my tent and read a little bit by lantern. Guess I fell asleep about 11:00 PM. When I awoke next morning I looked out to see the 2 ships, and they were busy as a beaver doing something. So I settled in my folding chair and watched both ships preparing to set sail. About 2:00 PM the Victory Chimes disappeared out of site. Shortly there after the Mistress followed them. I watched till they were out of sight. So for about 3 days that was quite an adventure for me. My two weeks at the campground was fast approaching. So I slowly packed things up each day till I was done. What amazes me is how God engineered it all even before I got there. There was no way I could of known I'd have those experiences that would last a lifetime. My day came to leave and I headed to the dock to get inline for the ferry to Rockland. If I did not get in line early I might not of made it onto the ferry for it was small. My dad was expecting me the next day, so I could not disappoint him, or worry him. Thank you God for this experience, smile. Below is a picture of me on the Mistress after breakfast when we were all chatting ! To email me click on the picture above !